The WHO (World Health Organization) believes there is in excess of 350 million people diagnosed with diabetes around the world and tens of millions more people suffering in ignorance. One alarming fact is that the average age of a diabetes sufferer, predominantly type II diabetes, continues to fall and the number of children developing the condition is showing signs of a major increase. There are numerous research programs which have created a very strong link between obesity, lack of exercise and diabetes type II in particular. A number of research notes have also shown that excess weight gains in childhood can be very difficult to fight in adult life. These two factors have led to growing concerns about obesity and diabetes. Heart disease and diabetes are perhaps the main potential problems awaiting children in their later years and despite the fact the risks associated with obesity are well advertised the issue is seemingly getting worse. Indeed the number of children drinking a soft drink each day has increased in recent times, fewer children are eating their prescribed "five portions of fruit and vegetables a day" and inactivity is now more common than it ever has been. There are many areas and many individuals who play a major role in the life and times of a young child from parents, to friends, to relatives right through to schoolteachers. In order to beat this growing obesity problem all of the relevant parties will need to work together and be singing from the same hymn sheet. 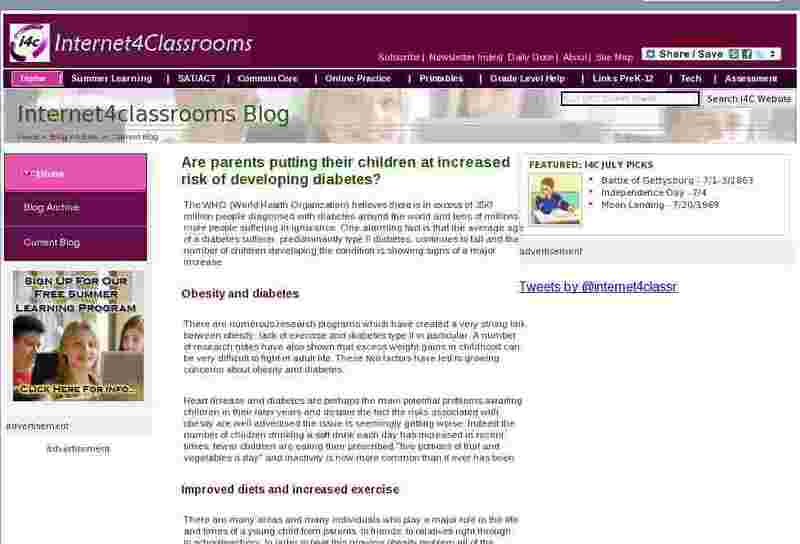 There are a number of issues which have occurred over the years which have not helped the situation including a lack of competitive sports across many schools, the emergence of games consoles and perhaps more controversially, accusations that various unhealthy products such as soft drinks are marketed specifically at children. In some ways it is easy to pass the buck to large corporations marketing particular products at children, to blame a lack of exercise and competitive sports across schools but this report today also confirms that the home life of many children is very different than it was 20 years ago. Three quarters of 13-year-olds, more boys than girls, watch at least two hours of television each weekday which effectively takes out the majority of their day when you include school time and mealtimes. This leaves very little time for exercise which is again feeding the problem which is obesity. The situation is no better at weekends with an average six hours per weekend day spent "inactive" despite the fact children have so much free time. There is no doubt that we need to see a major improvement in the diet of young children, we need to see an increase in exercise and all individuals involved in the life and times of children need to play their part. Some people may argue that monitoring the nutritional value of school meals brought from home is overkill but if this helps to improve the diet of young children and reduce instances of obesity, is it not a small price to pay? There is also the problem of health and safety issues, competitive sports at school and the general safety of children with so many dangers around today. Perhaps now is the time for the government to invest in grassroots exercise and activities for children, to increase the number of locations in which they can exercise in safety and perhaps look to take the focus away from games consoles and the online community, and bring the traditional community spirit back. We have seen the government announce a number of programs to help tackle obesity, improve the diet of young children and reinstate sustained regular exercise in the school curriculum. This report by the British Heart Foundation and Oxford University would seem to indicate a lack of progress at this moment in time and the need for more money, time and effort to be invested. It is not only the risk to life in later years which should be highlighted but also the fact that the cost of future treatment for conditions such as heart disease and diabetes is set to mushroom. Indeed many experts believe that the cost of treating diabetes in the future, if instances of the condition continue to grow at the current rate, could indeed bankrupt the UK National Health Service within 50 years. We are on the verge of a massive obesity epidemic, instances of diabetes will most certainly increase in the short to medium term and now we need to start looking at the longer term and promoting a healthier lifestyle across-the-board � before it is too late. If you are looking for advice about diabetes, the latest news or you are struggling to cope, visit the http://www.diabetesforum.com Diabetes News Community and join our 26,000 strong forum community.